Heavy, speaker-shaking tones are just a few clicks away with Bass Master. 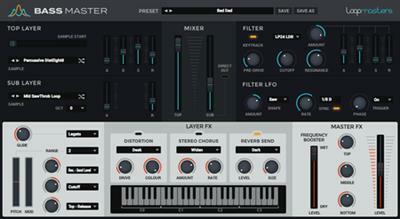 This instrument is totally dedicated to bass, and it's built on Loopmasters' award-winning sonic history. Bass Master's huge variety of source sounds provide the inspiration for a weighty, powerful bass tone in any genre. Across two layers, the curated set of 217 waveforms (that's almost 50,000 possible combinations), taken from a mixture of legendary hardware classics and cutting-edge synth science. Considering Loopmasters' pedigree as purveyors of top-quality sounds for decades, why accept anything less?